I hope you are having a wonderful three day weekend !! I love three day weekends... I feel I have so much time to stitch, but of course time flies by anyway and I never accomplish as much as I would like. ...and this little..... what should I call it? box??? The name is All Wrapped Up. 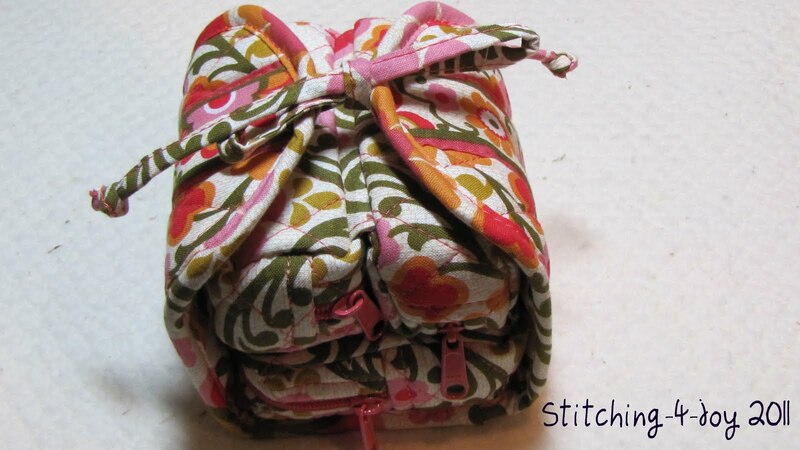 It is so great and can be used for make up, stitching supplies, jewelry.... so many different things. It is really versatile and I love the fabric on it. I am so touched by my friend's generosity and thoughtfulness. I love you guys !! .... y este otro "artefacto" que se puede utilizar como joyero, bolsa de maquillaje, para botones, agujas, etc. Es muy versátil y me encanta la tela. 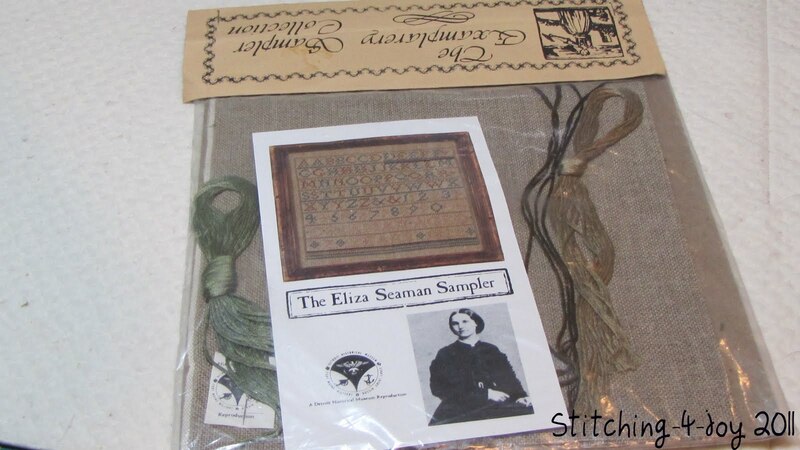 I also go this beautiful kit of the Eliza Seaman Sampler as a gift from my sweet friend Sherry. 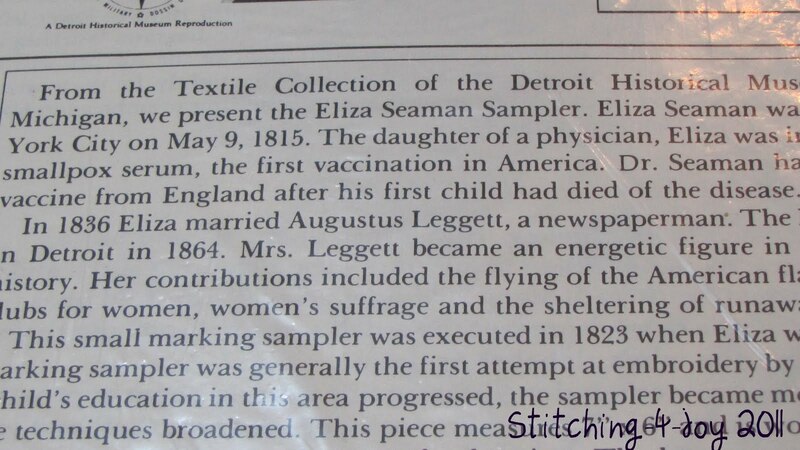 This chart is out of print by now and it is from the Textile Collection of the Detroit Historical Museum. 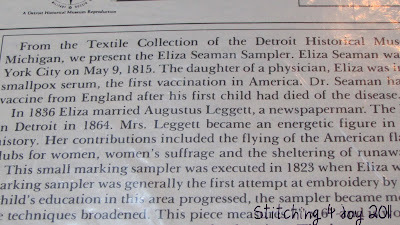 Eliza was the daughter of a physician and was inoculated with smallpox serum, the first vaccination in America !!! Isn't it interesting? 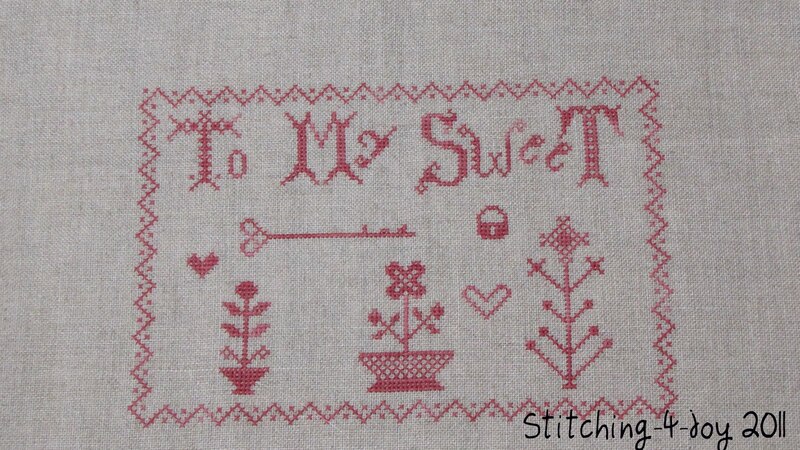 I love it and will be stitching it soon. Thank you Sherry !! Mi amiga Sherry me regalo este Sampler. Es un Sampler de la colección del Museo De Textiles de Detroit. Eliza Seaman era hija de un medico y fue vacunada contra la viruela. La primera vacuna en America fue la suya !!! Interesante, ¿verdad? Gracias Sherry !! 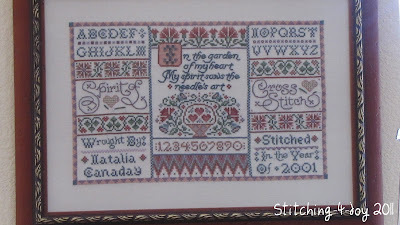 Below is a picture of Chessie and Me Birth Sampler that I stitched for two very special little girls in my life: Madelyn and Isabela. I sent it to have it framed by Jill Rensel (first time) and I just love what she did with it. If you have never had anything framed by Jill you have to. She is the nicest person and worked with me to get this framed very quickly so I could give it as a gift. Esta es una foto del Birth Sampler the Chessie and Me que borde para dos niñas muy especiales en mi vida: Madelyn y Isabela. Lo mande a enmarcar a una tienda bastante famosa aqui en EEUU y me encanta el producto final. Well, now it looks something like this !!!!!! 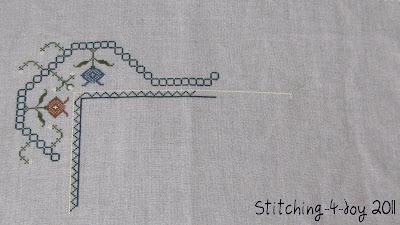 Yeah, The Frog Man came to visit and I had to undo pretty much all I had stitched. 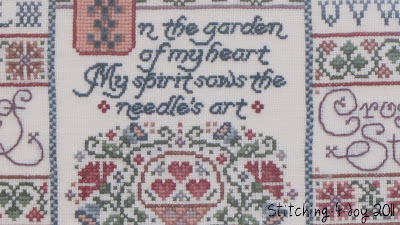 I made the tiniest mistake on the border and that totally ruined it. Oh how I hated having to do that.... Up until now, I'd only had to frog very little parts of my work, but now I certainly belong to the Frog Club. LOL !!! Pues ahora esta asi !!!!!! Si, cometi un error en el borde justo al empezar y me toco desacerlo practicamente todo. Que cabreo !!! Un error tan pequeñito lo estropeo todo. 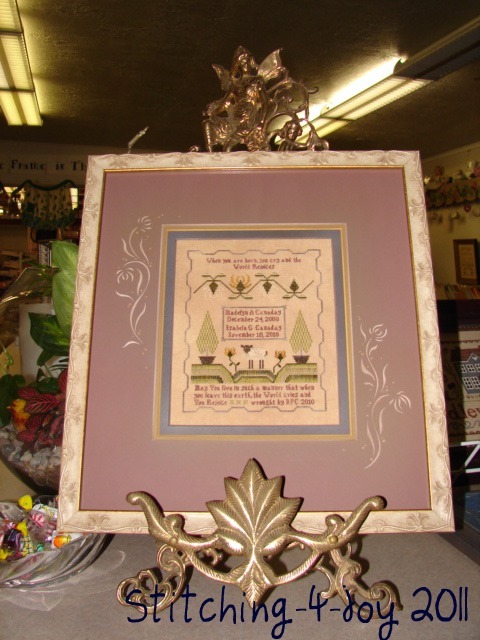 You must also remember how I told you that my Angel Band Sampler was the first sampler I had stitched, but actually that was not correct. 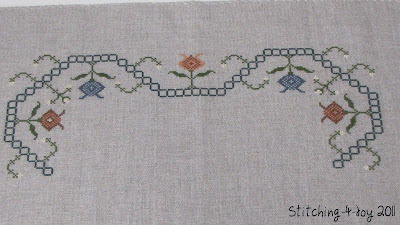 Below is a picture of my very first sampler. 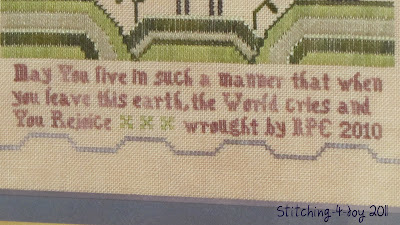 It comes from some stitching magazine (I don't remember which one) and it is so badly stitched, really. I can see all the threads that I crossed in the back and it was stretched so crooked. Someday I will take it apart and stretch it myself. I do love the frame though. It has a special place in my heart too !! También os acordareis de que os dije que mi Angel Band Sampler fue mi primer sampler, pero de hecho eso es incorrecto. Abajo podéis ver una foto de mi primer Sampler. Lo borde tan mal que podéis ver todos los hilos en la parte de atras. Que desastre.... ademas la tienda que lo enmarco, lo hizo todo torcido :-( Algún día lo tengo que deshacer y enmarcarlo todo de nuevo. 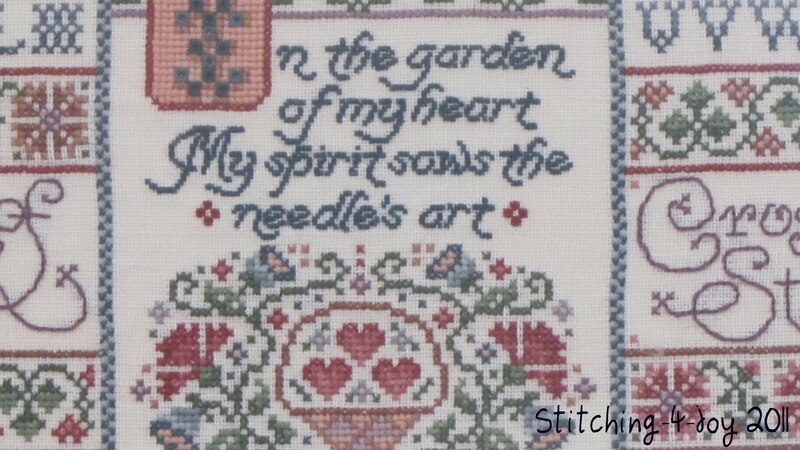 Here is another of my earlier stitched pieces. It is stitched in good old Aida fabric !!! I love the colors though. Esta es otra de mis primeras piezas. Bordada en tela de Aida !!! Me encantan los colores. I finished "Take Joy" from Shepherd's Bush and put it in this great little box. Isn't it cute? Tambien termine "Take Joy" de Shepherd's Bush y lo he puesto en esta cajita. A que ha quedado bonito? I am part of the Stacy Nash Club that Country Sampler offers. Stacy designs something exclusively for the Club and it is mailed to us every quarter. I love Stacy Nash's designs and this is the one for the first quarter. 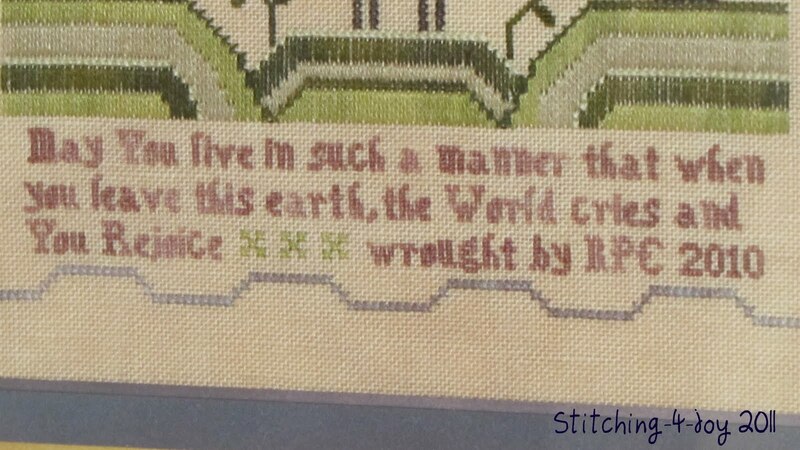 I only have it stitched, not antiqued or finished yet, so I'll show it again soon. Soy miembro del Club de Stacy Nash que ofrece Country Sampler. Stacy diseña algo exclusivo para el club cada tres meses y la tienda nos lo manda todo por correo. Este es el primero de todos. Solo lo tengo bordado, me queda envejecerlo y coserlo como un cojin chiquito. My stitch wallets have been selling nicely and I wanted to thank you all that bought them from me. I have gotten great feedback from all of you and I am so grateful and happy that you like them. I thank you, thank you, thank you for your business. It means the world to me. Keep checking, there are wallets being added every week !! This is all for today !!! I am always so happy when you stop by. For once I am caught up with my blogger reader and I have enjoyed seeing all your work. There are some works of art out there.... 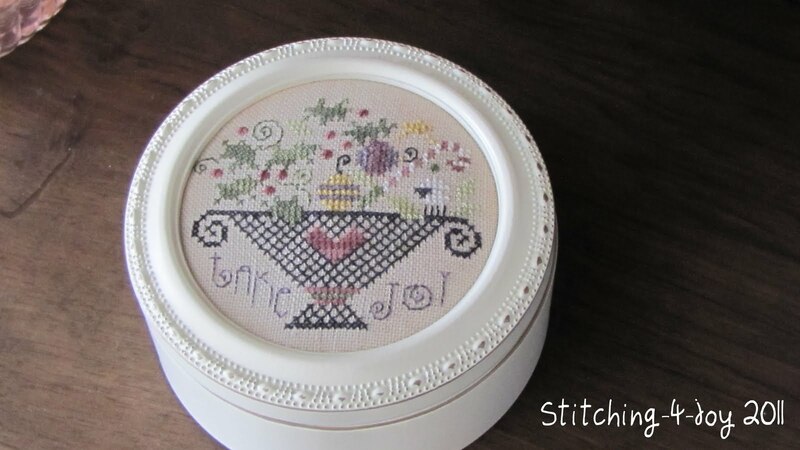 Many of you are such talented stitchers and I forever admire what you do. Esto es todo por hoy !!! Me encanta que os paseis por mi blog y os agradezco vuestros comentarios. Me encanta ver vuestro trabajo tambien. Hay verdaderas obras de arte por el mundo de los blogs....y muchas de vosotras tenéis verdadero talento y mi admiración. Qué de cosas nos has enseñado! Ánimo con el que tuviste que deshacer, a mí también me ha pasado y da rabia, pero ya verás qué bien te sientes cuando lo tengas acabado. 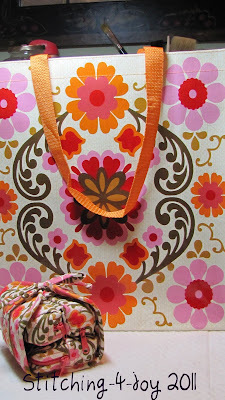 I love your Vera pieces - your friends are very nice!! 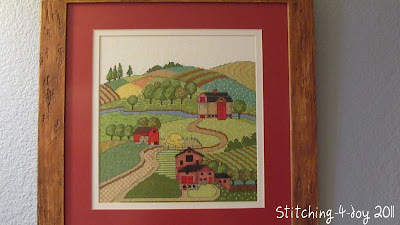 I love the birth sampler piece you've received back from Jill Rensel--gorgeous stitching and her framing is wonderful. And that little SB piece in the white box is so cute! What sweet friends you have to give you those VB things! I so agree about Jill Rensel -- she's wonderful! Love the birth sampler and how she framed it for you! Great progress on I sigh not for Beauty! Bummer about the frogging though. I hate frogging! I love your two older pieces, especially the first one. And Take Joy -- beautiful! What a fun post, you have the bestest friends ;-). Had a great day Saturday at your house!!! 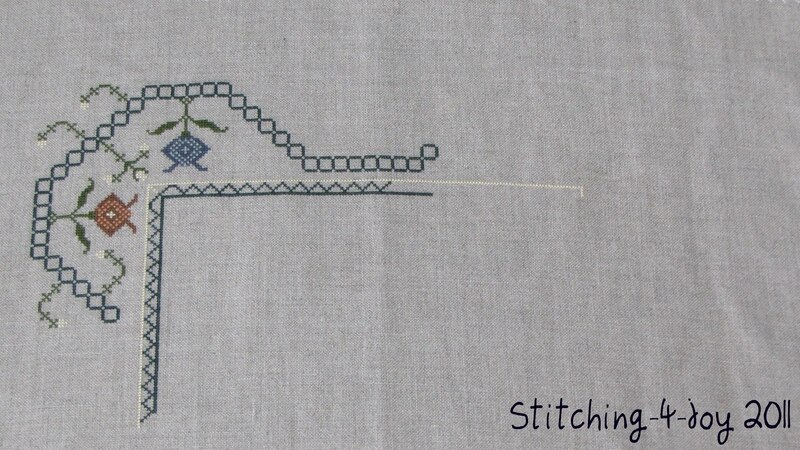 Love all the stitchy pics, sorry about that rotten frog :-(. 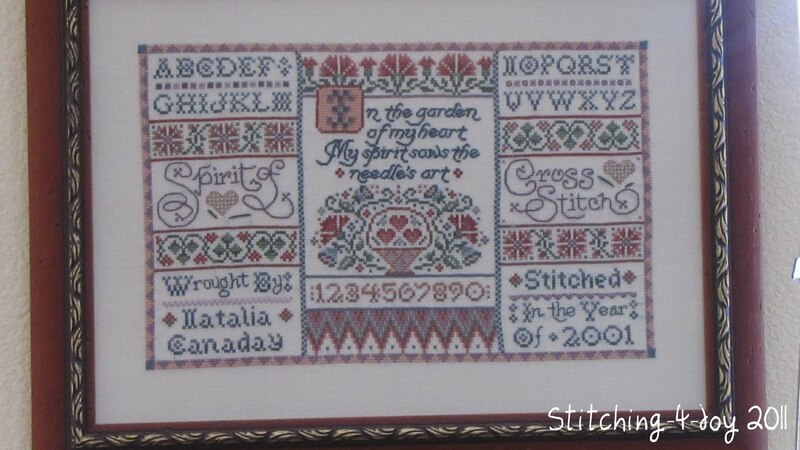 The birth sampler is just gorgeous, I love how Jill framed it. What lovely things from your friends! 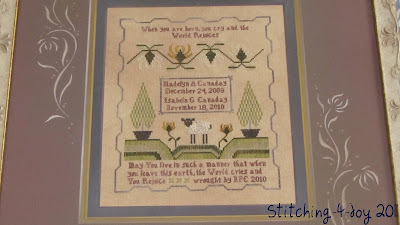 Your stitchy pieces look wonderful - and that birth sampler is amazing! 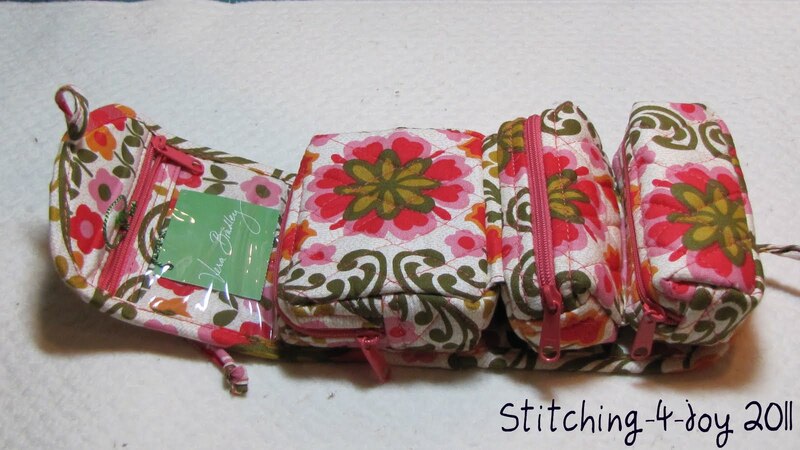 So glad to hear that your stitching wallets are selling so well! Wow, lots of great stuff! 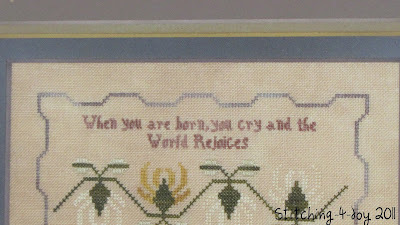 Love Jill's framing of your baby sampler. It's beautiful. The Take Joy finish came out great and so did the little SN piece. Sounds like a fun time at your sttiching gathering at your house. Sorry about the frog but I Sigh for Beauty will be a stunner when you get done. What lovely gifts from your friends. So many beautiful stitched pieces, just love the SB! 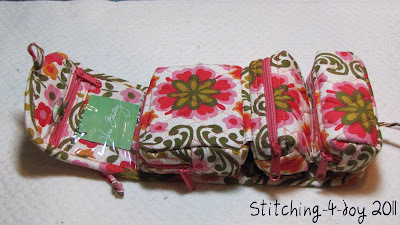 Love the Vera gifts! And your framed birth sampler is fabulous. 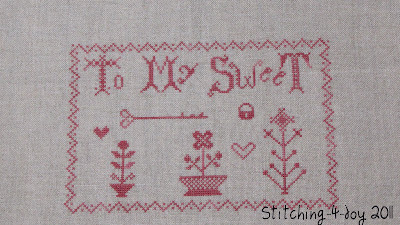 Lots of pretty things you've been stitching - so sorry for all the ripping out you had to do though! Thank you for following my blog. I look forward to following yours as well. 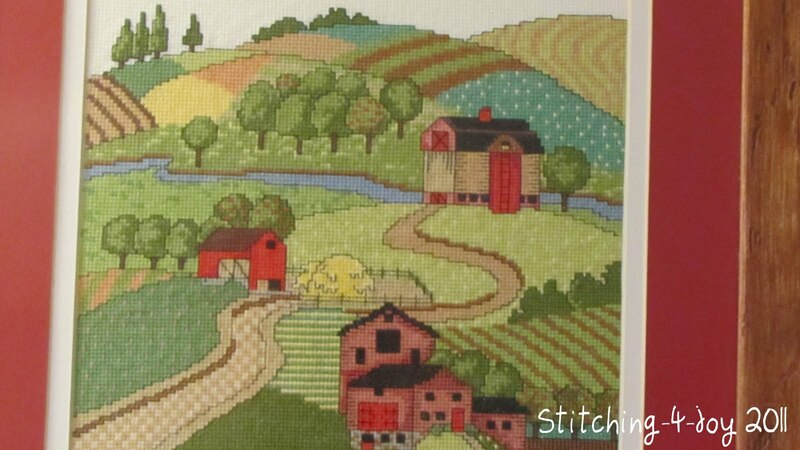 I really like your piece of the country side with the barn and all the different fields. Just wonderful. Espero que ya estés más animada. Qué cosas tan bonitas tienes bordadas y los regalos preciosos, se nota que te quieren. Besotes y gracias por pasar por mi blog. Wow love all your finishes! Jill Rensel did a great job! I can't wait till I get mine back home. Hope to see you....I am coming to CO in the first week of April! que cosas mas bonitas haces y tener un grupo para hacer labores es maravilloso!!! Ahora que estoy con mi hija pasando una temporada me doy cuentas lo bien que lo pasamos las dos haciendo cosas juntas. No te dejo más comentarios porque algunas veces no soy capaz de que blgger me deje pero siempre te visito. gracias por la dirección de Sue Spargo es una verdadera artista!!! y es cierto que el patch engancha. Aquí estoy otra vez!!! gracias spor apuntarte al sorteo Natalia y he recibido la vista de tu amiga Katrina, me ha hecho mucho ilusión y además tiene un blog maravilloso. Thanks for visiting my blog :) I was thrilled to see the result as well as our friendship to support my country. You have some gorgeours projecst going on here!! Are you going to post their progress some time soon? Hola Natalia, acabo de descubrir tu blog y me gusta mucho lo que veo en el. Me quedo para seguirte.